Directorate of Elementary Education (DEE), Assam invited online applications for recruitment of 6027 Teaching Posts (Primary Teacher, Assistant Teacher, Hindi Teacher, Science Teacher & Arbic Teacher) for Lower Primary Schools and Upper Primary Schools. Eligible and interested candidates can apply online through the official website from 08.04.2017 to 30.04.2017. 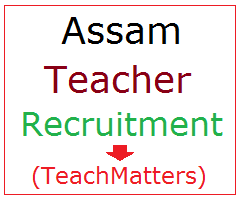 Check here latest details of DEE Assam Teacher Recruitment 2017 Online Application, Age Limit, Eligibility Criteria, Educational Qualification, Syllabus, Written Test Schedule, Admit Card, Result & Interview Dates 2017. Assam Govt. through Elementary Education Department invited online application for 3088 Assistant Teacher (Primary) posts for Lower Primary Schools. Here is the detail. Assam Govt. through Elementary Education Department invited online application for 2939 Teacher posts for Upper Primary Schools. Here is the detail. Pay Scale : Pay Band II @ Rs. 5200-20200/- + G.P. Educational Qualification - Educational and other qualification will be as per the advertisement and as per the specific post the candidates want to apply for. Eligible candidates can apply online through official website from 08.04.2017 to 30.04.2017.